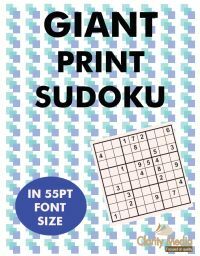 Welcome to this amazing collection of 100 fantastic extra-large print sudoku puzzles that we are calling giant-print sudoku; sudoku doesn't come bolder or more clearer than this! Each puzzle is printed with digits that fill the squares, are printed bold and black, on high-quality white paper for good contrast. The given numbers in each puzzle are printed at a whopping 55pt - that means each number is 0.76 inches, or almost 2 centimetres, high - very easy on the eyes and great for those who are no longer able to clearly see a sudoku puzzle printed at the standard newspaper size, and an even larger font size than used in standard large print sudoku books. This book contains 100 extra-large print grids, which are all 9 x 9 in size. All you have to do is to place each number from 1 through to 9 exactly once in each of the nine horizontal rows and the nine vertical columns that compose each grid. In addition each 3x3 bold-lined region of 9 cells must contain the numbers from 1 - 9 exactly once. That is all that there is to it! If you are in any doubt as to what a solved puzzle looks like, simply take a moment to turn to the solutions at the back and look at a few of the grids. Our giant sudoku puzzles solve just like a standard sudoku puzzle, the only difference is that the font size is so much larger so that you can clearly read it. If you currently solve sudoku puzzles by using a magnifying glass or other visual enhancement aid to make the print larger, we hope you will find that these extra-large print sudoku do not enable you to use such aids, allowing you to enjoy the process of solving the sudoku puzzle without worrying about whether you have read a digit correctly. Each puzzle has an attractive symmetrical design with the given numbers, and there is also plenty of space for pencilmarks due to the size of the grid. Therefore for those who are simply fed up with having very little space to write notes or pencilmarks when solving sudoku then these puzzles would be great for you: rather than being forced to write tiny pencilmarks that are hard to read into a grid, with the book of giant sudoku there is lots of space to write in pencilmarks as you go along. We hope that you enjoy these volumes of giant print sudoku and find the grids clear and the puzzles fun to solve - rest assured there is always a single solution that can be reached through logical rules alone. 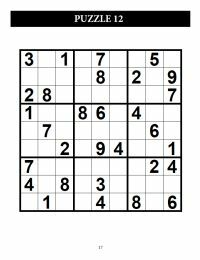 If you have any ideas for other related huge print sudoku you'd like to see, or any thoughts that would help make sudoku or other puzzles visible to those who struggle to read standard-sized newspapers puzzles, then we would be very pleased to hear from you so please do contact us.